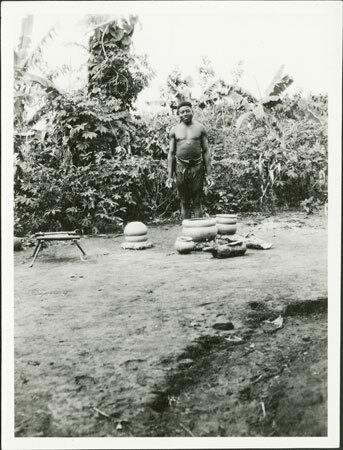 A man standing beside his coil-technique earthenware pots (pere). To one side is a bench seat (kitikpara) used by the maker. Morton, Chris. "Zande potter with pots" Southern Sudan Project (in development). 03 Jan. 2006. Pitt Rivers Museum. <http://southernsudan.prm.ox.ac.uk/details/1998.341.244.2/>.